If you the owner of a dog or cat, and you really love them, you may want to consider purchasing Embrace Pet Insurance. Why? The answer is simple. Sooner or later something might happen to your fur-baby. They could get hit by a car, attacked by another animals, break a limb, or get really sick. Without pet insurance, you may be faced with the most difficult decision of your life- paying thousands of dollars in medical bills or saying good-bye in the most painful way. Embrace pet insurance is one of the best companies out there that has your back in case disaster strikes. Embrace Pet Insurance put their money where their mouths are. Since 2003, their mission has surrounded their core values of compassion for both pets and their owners. They strive to be innovative in that “nose-to-tail” insurance and are open and honest with all that they offer and what the process is. Their passion for not only pets and their owners also drives their successes in their community, putting their innovation to work. The company itself strives to “be green” and to give back to the community in a number of ways, including giving away $10,000 in their Secret Santa Project three years ago. But, that isn't what is really important to you, is it? What matters to you is what they will do for you when you and your pet needs them most. What does Embrace Pet Insurance cover? Well, provided that you pet is fourteen years or younger, you are eligible for both accident and illness coverage. Embrace is great, because it covers a wide range of things that you need pet insurance for. Coverage with this company includes breed-specific conditions, behavioral therapy, diagnostic testing and imaging, prescription drug coverage, surgery, hospitalization, nursing care, cancer treatment, emergency room and specialist care, prosthetic limbs and alternative therapy. In short, Embrace Pet Insurance basically covers everything that human insurance covers. But, think about it. Just about anything that happens to you can happen to your pet. Wouldn't you want to have the best coverage possible so that you didn't feel any pain? The simplest procedures can cost thousands of dollars at a Veterinarian. Embrace is an awesome company, but just make sure you read the guidelines of what they do not cover. For example, if your dog or cat has a pre-existing condition, they will not cover future expenses. The company also does not cover pregnancy, injury caused by abuse from the pet owner, illness resulting from fighting or any cosmetic procedure such as cropping, DNA testing, stem cell therapy, organ transplants or any illness related to the teeth or gums of your pet. This is important to know prior to purchasing pet insurance. When it comes to your puppy or older dog, Embrace Pet Insurance is great about coverage for accidents, illnesses, and routine care- and offers a wellness program for prevention. If you have felines, they get the same coverage. The great thing is, is that Embrace truly cares not only about your pet, but your wallet as well. They will personalize your policy to ensure that you will be able to afford the coverage that you really need- and not try to sell you things that can't afford or really don't need. Basically, you get to alter the cost of your premium by deciding the details that your policy will contain. For example, depending on the annual maximum you choose, the deductible, and the percentage of reimbursement the amount you will pay for your monthly premium will differ. Not many other insurance companies offer this kind of system. Usually, you pay the set amount each month that they offer you, regardless of how much or little of the coverage that you want. Not only that, Embrace Pet Insurance offers six different types of discounts to save you even more money. Embrace reimburses you a straight percentage of your vet bill, unlike other pet insurance policy companies. Embrace is honest about how they compare to other companies as well. On their website, they put themselves to the test truthfully against nine different pet insurance companies. Honesty means stating that compared to other companies, Embrace's insurance premiums will increase over time- just like the others. There are no secrets- they are honest from the get go. Even with insurance companies, like ASPCA Pet Health Insurance, Embrace is close in comparison, but they will state how their insurance policy will differ. Many other insurance companies offer the same policy details as Embrace Pet Insurance, but for an extra cost. For example, just like with human health insurance, you can purchase alternative therapies for your pet with Embrace. Other insurance companies, like Trupanion, offer alternative therapies, but you have a higher co-pay or premium, which is an additional cost. jNot only do other pet insurance companies charge for additional services, they also impose limitations within the fine print of the contract. For example, Nationwide Pet Insurance has 183 different limitations on hereditary and genetic exclusions, while Embrace has zero. Why is this important? When you pay monthly for medical cost protection for your pet, you want to make sure that when you need it, your dog or cat is not excluded with a minor catch located in pages of legal mumbo-jumbo. Embrace makes it easy- and it is straight forward. When you sign up for pet health insurance, who wants to pay an enrollment fee? Companies like Healthy Paws charge you $25 or more just to sign the papers to get the ball rolling. Embrace doesn't do this- because they know many consumers have a limited budget. Also, some insurance companies make you pay the co-pay and then the deductible. Not Embrace- you pay your deductible, and when you reach that, you are only responsible for your co-pay and the remaining percentage of your vet bill. 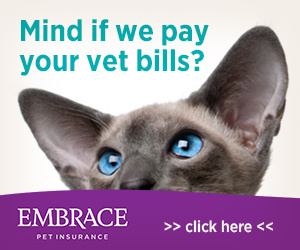 In some bases, Embrace will cover up to ninety-percent of your vet bill costs. If this is the first time you are purchasing pet insurance, Embrace will walk you through the process one step at a time. Not only that, they offer six tips on shopping around. There are things that you may not consider when purchasing a policy, but Embrace highlights important features and limitations that you need to be aware of before you purchase, not when your pet needs it. For example, you need to look at the benefit schedules of different plans, to make sure you are not paying more than you need to. Also, make sure that you read the fine print when it comes to pre-existing conditions, hereditary issues, and per-incident charges. Become educated when when you are purchasing a policy- and companies like Embrace understand how daunting this can be. That is why they are straight forward and honest to prospective consumers and clients. Once you purchase a policy, Embrace Pet Insurance outlines what will occur next. There is a waiting period for when your policy kicks in. For example, you will have to wait for two weeks prior to your insurance to kick in for illnesses. Accidents or other incidences can take anywhere from two days to two weeks. Depending on your state, there is also a waiting period for conditions like orthopedic procedures. This is typical for any insurance company, but knowing this should encourage you to get a jump-start on signing up for your policy. An option that you have is to complete a medical history review. This is done just like a human health insurance policy. It just provides you peace of mind, and does not impact your policy. You can only get this service after you enroll for Embrace Pet Insurance. If by chance it is discovered that your pet has a pre-existing condition, you have the option of canceling your insurance with their 30 day money back guarantee. If you do not file a claim, your deductible will decrease by $50 each year. So basically, you get money back for keeping your pet healthy. Also, with the Wellness Rewards, you have more opportunities to save money by keeping your pet healthy with routine care. At any point, you can change your coverage to meet your needs. Adjusting your policy is sometimes a hassle with some insurance companies, but Embrace will walk you through it one step at a time. They really care about their customers, and want to help you find the best coverage for your budget. Making a claim is very easy, and the response time is minimal. The customer service representatives that work at Embrace are so helpful! There are three different ways that you can file a claim- you can call their telephone number to have a form mailed to you, complete the form that comes in your enrollment packet and you can also download and complete a claim form from their website. It couldn't be easier! Embrace Pet Insurance is by far one of the best companies that you can purchase a policy for. Your pets are part of your family, and you shouldn't have to choose between getting the best care for you dog or cat, or losing them because it is cheaper to put them down. Why put yourself through that kind of trauma? If you purchase your policy from this company, you will definitely be making the correct choice that will protect you for years to come.